At St. Pascal Baylon Catholic School, we strive to develop in our students a deep awareness and appreciation of Catholic Social Teaching. Our main goal is to instill in our students an understanding of their Christian responsibility to help others, leading to a life-long calling to love and serve as Jesus did. “Then the King will reply, ‘I tell you, whenever you did this for one of the least important of these brothers of mine, you did it for me. '” Matthew 25:40. 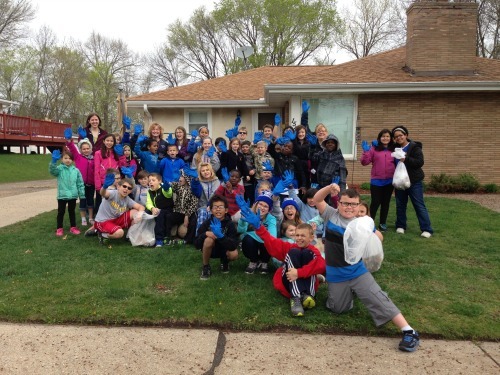 Throughout the school year, students participate in various community outreach projects. Rake leaves in the fall for elderly neighbors. This involves students working with their prayer buddy classroom to rake, bag and remove leaves. Share Halloween candy by bringing it to school, bagging it and donating it to a local shelter. Decorate a “Hat and Mitten Tree” at Christmas time with donated winter items to be given to a local shelter. Collect items such as white socks and t-shirts to be given to Listening House. Reach out, as specific needs arise, with donations of food and other necessities. Culminate the school year with “Fun & Fitness Day” which consists of various games that reinforce team effort and good sportsmanship between students and their prayer buddies. The students at St. Pascals leave our building knowing that their love of God is inseparable from love of neighbor.